When I got home from Little River Inn Rug Camp, I found a couple of rugs on my door step… from Cec Caswell and Laurie Wiles of Edmonton, Alberta! Wow! 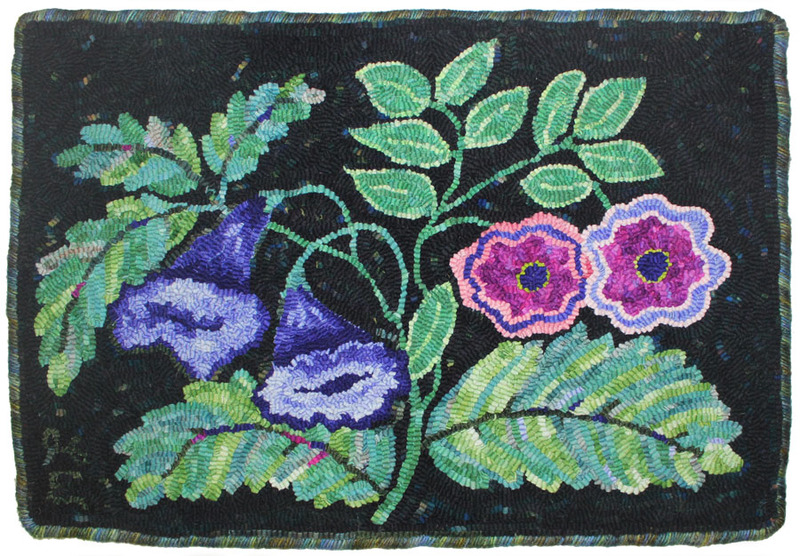 Cec uses the alternating stitch in black & white to outline her flowers and leaves! 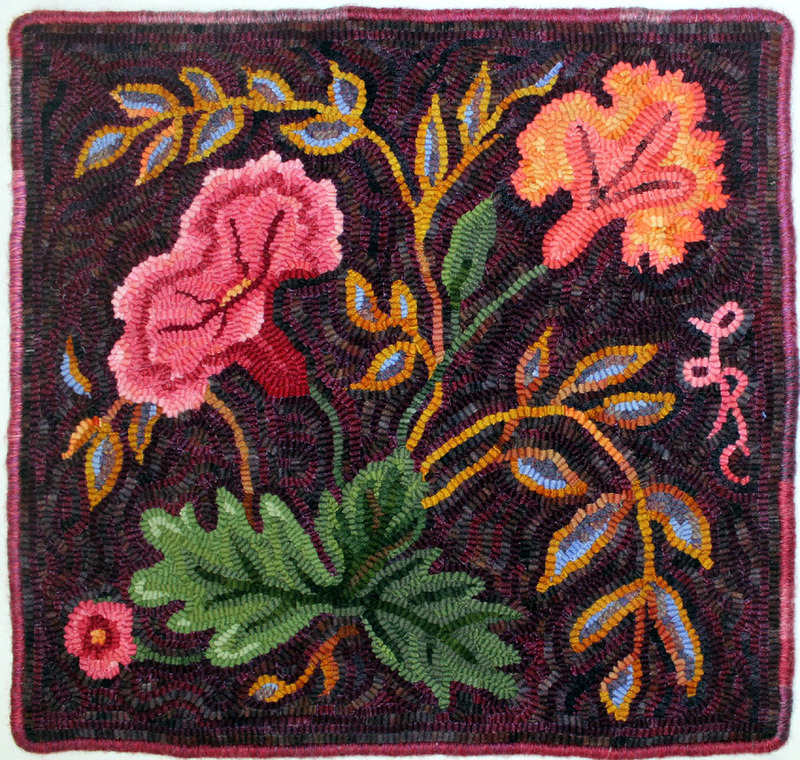 this is often her signature stitch… though it is most often around the edge of the rug. I love it! Laurie handles her purple throat flowers with finesse! The leaves too, are interesting with a variety of colours! 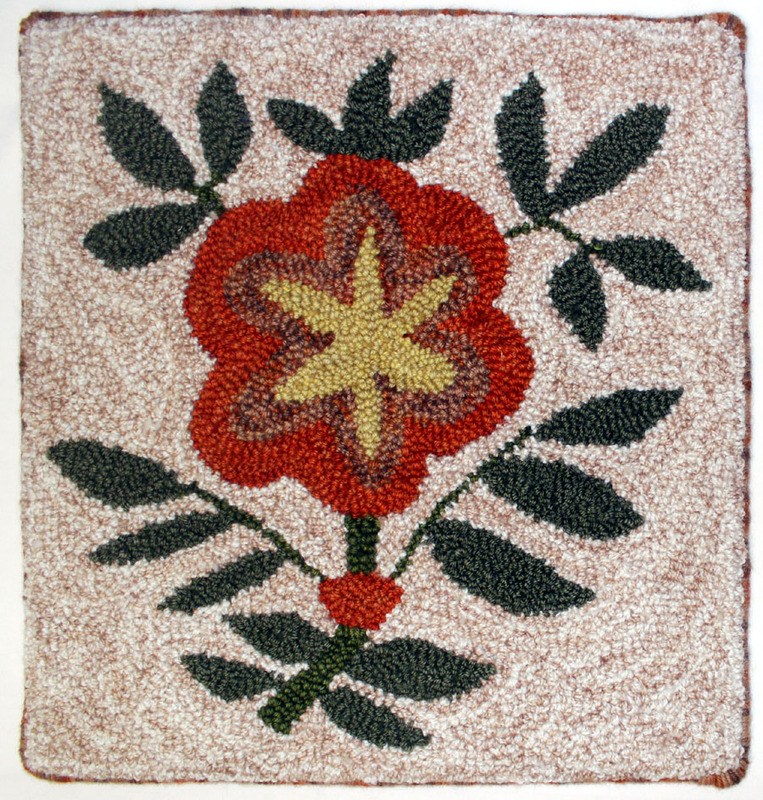 My friend, Nancy Terhaar, is hooking this pattern for the Caswell Impressions. I haven’t seen hers yet… but she talked about how it represented her and her sweet husband, Ron. I was inspired after hearing that; I had to hook a version of my sweet husband, Kirby, and I. We got married in 1973; a time of ‘Open Marriages’… not that we would have such a marriage; we were much more traditional and would just be ‘we two’. It was a home grown marriage; I sewed my own dress and wore flowers in my hair. Kirby bought some cool clothes at the local haberdashery. Our plain gold rings cost $12 for mine and $17 for his. It was supposed to take place in the park across the street from my folks home, but it rained. We all crowded into my folks living room; it was intimate and wonderful. The sun came out afterward, so we took our photos outside. 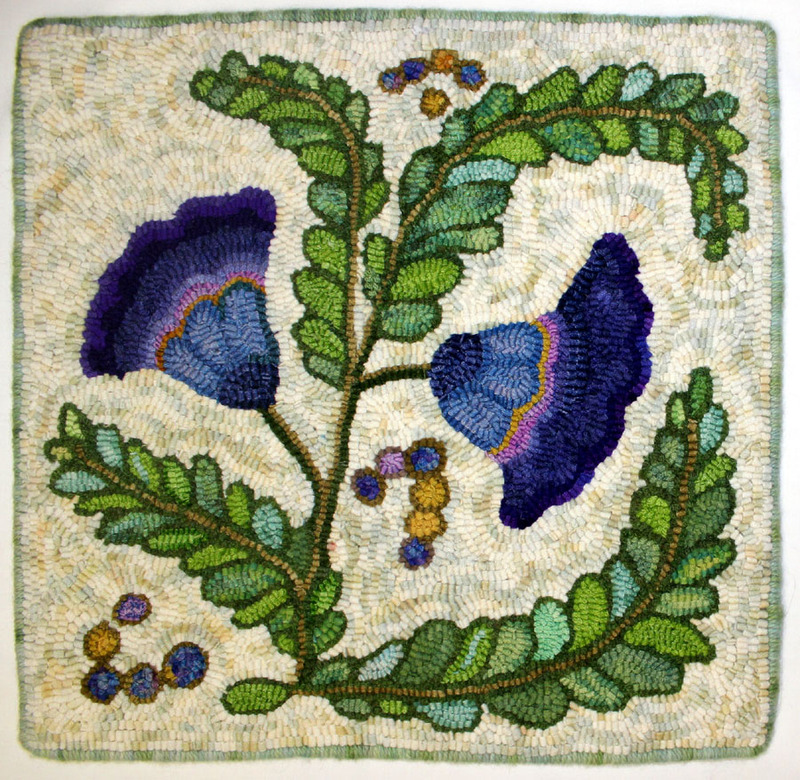 Ruth’s bluebells border on purple; the spotty green background is perfect! of course, I love her outline and fill randomly leaves. Ruth’s work always pleases me. Simple and powerful, Karyn’s flower stands on it’s own. 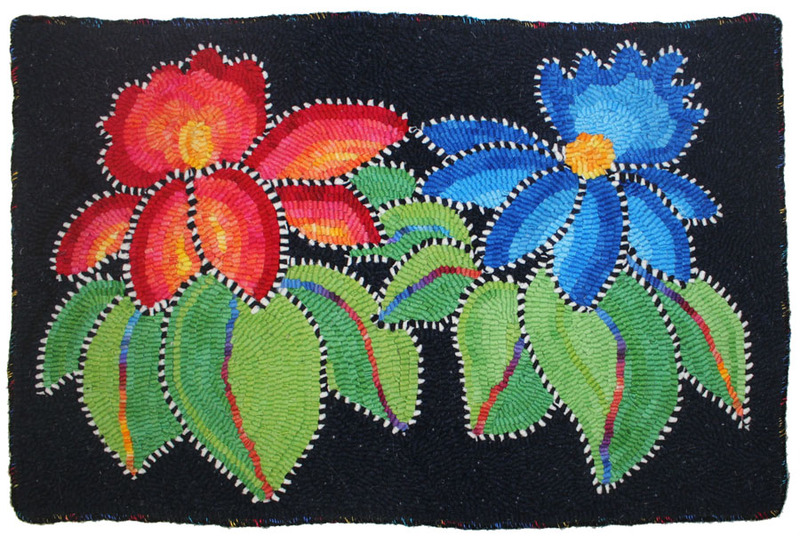 Her finished edge uses the same yarn as the middle colour in her flower. Perfect! Loving the blue and red flowers; the blue showing up again on the leaf tips! The dark background sets everything off perfectly. All the way from the Yukon! That place that’s almost like outer space… far, far, away! Leisa teaches school and lives off the grid up north in Canada. We met at Puget Sound Rug School, then again at Western Teachers’ Workshop. 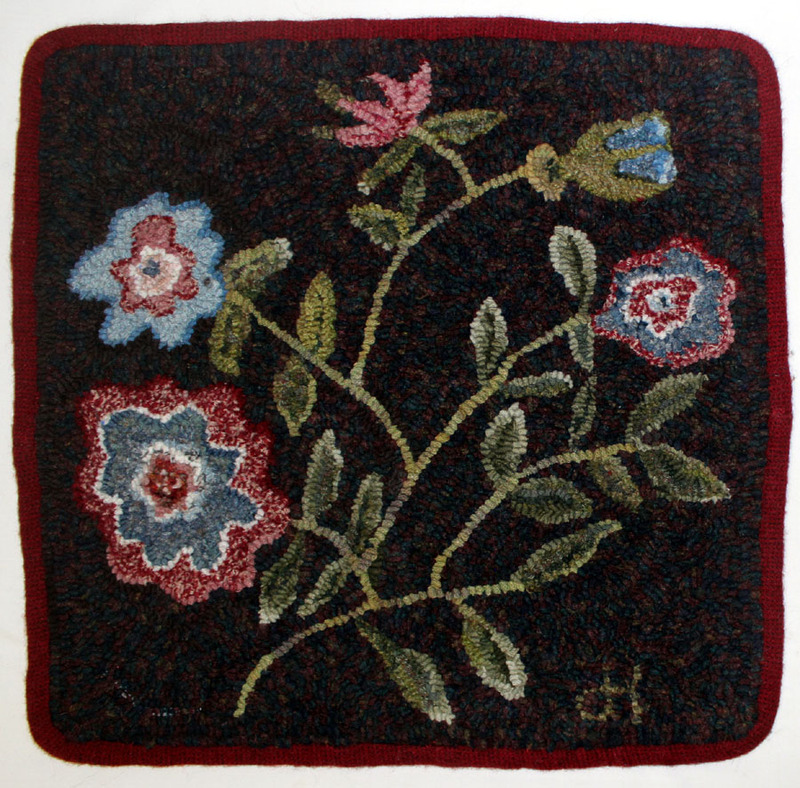 She and her friend, Lise Merchant, are going to teach rug hooking in the Yukon… yaye! I love the colours in her rug; the golden edged leaves with light blue high-lights glow and murmur. Just 5 more to arrive… I’m looking forward to that! The Caswell Impressions will be shown at Sauder Village in August, 2017. 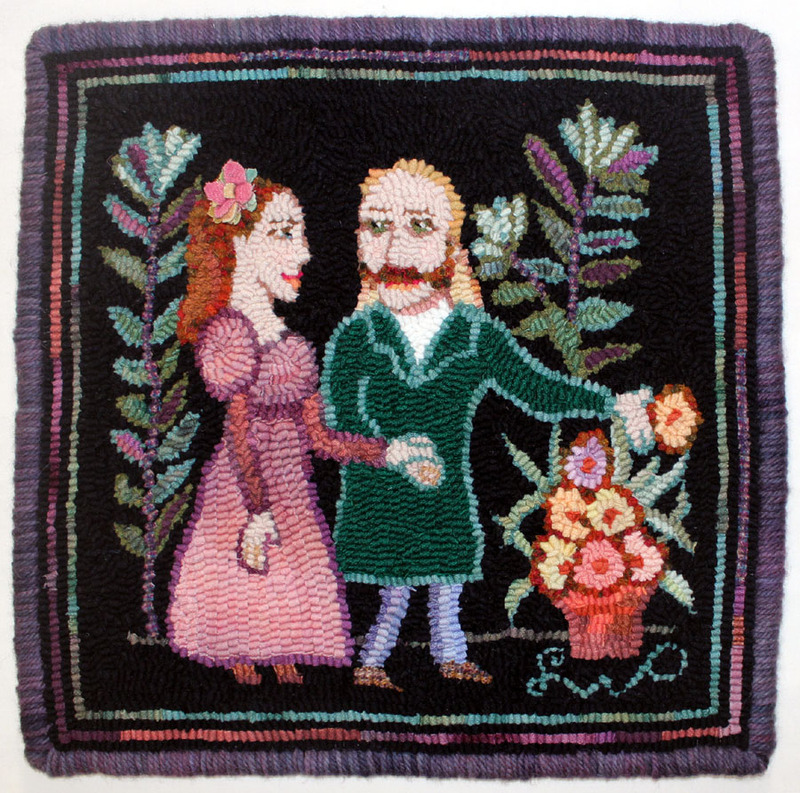 My friend, Barbara Larsen, and I will be driving out to Archbold, Ohio, to deliver the rugs at Sauder village. We can stop by your place on the way; let me know if you’d be up for that.